Water and dampness can both have devastating effects on buildings unless they are waterproofed. Extended exposure to wetness can cause your structure to deteriorate both inside and out and can pose a health threat to people using the facility. The costs involved in repairing a building which has sustained water damage will be much higher than if you’d just waterproofed it in the first place. There are a number of different reasons why a building can develop water leaks. Possibly the materials used were too porous or flawed, splices could have been sealed poorly, or cracks may have formed when the building settled. Humidity can also cause water problems both inside and out, and so can groundwater. Before treating any surface, you need to make sure the area is clean so that your sealant will stick. You will be able to treat new surfaces as well as those which have been treated before, and for best results you want to apply the coating well before you notice any leaks. 1- Surface waterproofing which can be done by coating surfaces with various products such as vinyl pastes, resins, and sealants. 2- Integral waterproofing, such as what you might do on your driveway or patio cement, which is sprayed onto the surface and soaks in to stop water from permeating the area. 3- Hydrophanous waterproofing which works to resist compression, decrease corrosion of steel, eliminate the formation of cracks, and to extend the surface’s life. The term rigid waterproofing is used to mean treatments which will waterproof concrete structures. These include additives for concrete and coatings made of epoxy, plastic, or metal. Flexible waterproofing, on the other hand, is for non-rigid structures which are those capable of movement which could make them sustain damage and allow water to leak in. This type of waterproofing must be able to move with whatever it’s protecting. 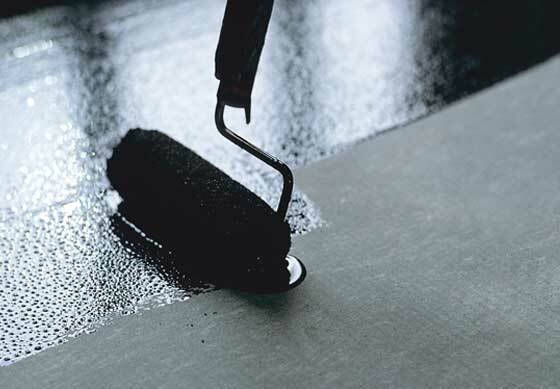 Flexible treatments include membranes, asphalt, and polymer, vinyl, and acrylic emulsions. You’ll probably find that using one or a combination of products will take care of your water problems. The best way to know what to use is by contacting a waterproofing professional who can give you tips for what to use on your building. Whatever measures you take will have the positive result of preventing your building from being destroyed by water.